our library trips lately have been fairly epic. the new book section appears to be freshly stocked in the kids room the last few weeks and this means lots of stacks of books around the house....... and lots of "buuuk" aka book, "mowwww" aka more, and geeeen aka again. sometimes i am busy doing something when these requests are being made. sometimes i feel like reading something a little more compelling than that of "go dog go". but i never ever turn down a request for book reading. books have proved to be a source of comfort, inspiration, entertainment, and education for me throughout my life, and i feel that taking the time to read anytime i am asked too is one of my more important roles as a parent. some of the happiest times in my childhood came on library day. where i lived, the library was in a small little mobile building, it might have had 600 books total. it stayed there until i was in middle school, and then they build a big nice library beside our school. my dad took me once a week and i remember filling up my bag full of books, going home, and reading late into the night. i read a lot of good books and a lot of fluff books, baby sitters club anyone? i remember discovering period novels about girls my age or older and being enthralled by the ways of life, i never felt like i could get enough, and still cant! little house on the prairie is still one of my favorite series. my goal is to constantly capitalize on crosby's curiosities and interests anytime i am able. slowing down and enjoying "go dog go" or "curious george goes to the library" 3 or 4 times IN A ROW is a small price to pay, truly. this is the book for kids who love trains. it describes the imaginations of this little boy, and the book is from his perspective. it is also a great book for discussions about younger siblings. in the book, the narrator, a little boy, has a little brother who isnt yet able to play with the trains, but he cant wait for them to share that passion. he describes his dreams of being a "train man". he says "all aboard" and "choo choo" several times, so for that alone, crosby gives it two thumbs up. he has even figured out which pages those words come on, and will now "read along" with me. i think this book could appeal to children from 16 months up to 4 years old. it is simple, but the subject matter is well loved by sooooo many children! crosby has become the train addict so this book has been a recent favorite. monkey's friends has become a favorite. i have been scouring used book stores looking for a copy for us to own. in this book, monkey is on a journey and meets lots of friends along the way. every other page is a half page for the reader to guess which friend he has met next before turning the half page. the writing has a good cadence and rhymes as well, which really meets the needs of so many readers who are in between the ages of 1-3. the art is also really nice, and would be a great book to attempt to recreate as an art project! i was inspired to write this post by bird and little birds, library mondays. ahhhhh! i love that blog! but, seriously, along with some knitting, some canning, and lots of mountains/ outside time, books are whats goin on in our land at this moment. oh! and i will link up with yarn along from small things on wednesday to let you know what i am reading (and knitting!) these days. canned crockpot applesauce and more- a few instructions. i am really into my crockpots right now. i actually have 2.
and i use them both all the time..... several times this season i have used my crockpot to slowcook something that i was going to preserve for the winter. i use the slowcooker on the high setting, put everything in, as the canning recipe specifies, and i walk away for a few hours or 5, come back, put into hot sanitized jars and can in the water bath for the specified amount of time. there was a time in my life when i was able to stand in front of the stove stirring a big pot of applesauce, tomatoes, or strawberry jam. this season of my life, with an active 18 month old and a husband who is currently remodeling our home, does not include leisurely stirring a pot of strawberries or apples to put by, and i am learning to accept that. but, that doesnt mean i gave up on my food preservation efforts. i have learned to take advantage of what i have, which is an 18 month old who is eager to help for small periods of time and a husband who is eager to let the 18 month old help him hammer nails in to the wall until he looses interest. i have an amazing apple peeler that was 20.00 that might have been my best investment yet. it peels and cuts the apples into rounds and takes about 15 minutes to peel, core, and cut 30 apples. seriously, it is no kidding amazing. its similar to this one, but mine is from mast general store. below are my recipes for applesauce and apple butter. if you have come into some apple wealth and not really a whole lot of time, this recipe is made for you. a half of a vanilla bean, cut down the middle to expose the beans *optional! peel, core, and chop your apples. (alternately, you could skip this step and just chop the apples, core, peel and all and then put through a food mill or sieve before canning.) place in crockpot until completely and totally packed full. my slowcooker is a 6-qt and i can fit anywhere from 25-30 apples in it. adjust your spices if you can fit less or more. after its full of apples, i add the lemon juice, cinnamon, and water/applecider. i tuck the vanilla bean down into the apples, if using. i turn my cooker on med/high, and cook for about 5-6 hours. after about 4 hours, i usually take of the lid and mash the apples for good measure, but its not that necessary! once the consistency is right, i turn off the slow cooker and get my water bath going if canning. (if making applebutter, see below) if you havent canned before, check this website out! ladle into sanitized pint jars and process in a waterbath for 20 minutes. you could of course just put this directly in the fridge as well! this recipe makes 5 pints of applesauce. here are some good resources on canning. please consult a book like the ball blue book of canning if you have never canned before! i am by no means an expert. peel, core, and chop your apples. place in crockpot until completely and totally packed full. my slowcooker is a 6-qt and i can fit anywhere from 25-30 apples in it. adjust your spices slightly if you can fit less or more. after its full of apples, i add the lemon juice, cinnamon, sugar and water/apple cider. i tuck the vanilla bean down into the apples, if using. i turn my cooker on low, and cook for about 15 hours or over night. alternately, you could cook on high for 8-10 hours. after about 4 hours, i usually take of the lid and mash the apples for good measure, but its not that necessary! put all of the apple butter through a sieve to get a nice buttery consistency and return to the slow cooker. if it taste right, then i turn off the slow cooker and get my water bath going if canning. you might want to add more sugar if you think it needs it. if you havent canned before, check this website out! ladle into sanitized pint jars and process in a waterbath for 20 minutes. you could of course just put this directly in the fridge as well! this recipe makes about 8 half pints. so if canning or crockpotting isnt really your thing, try dehydrated apples. (last picture) i assure you they will be your thing! dehydrate your apples at 130 in a dehydrator or the lowest possible setting in your oven. just place on racks and let them go for 5-6 hours. they last for several months, but i never have found out how much longer beyond that, because they are always gone before i know it. i started this adorable sweater ohhhhhh, about 4 years ago. i wasnt doing so well with the lace pattern for some reason and ended up ripping it out except for the cabled collar. it has stayed in my ravelry queue waiting to be resumed. everytime i looked in my yarn stash, this yarn made me feel guilty because it was just sitting there. i had a terrible feeling i would end up taking it to goodwill in 20 years, completely unused. i tried to find something else to do with it but i didnt have enough for any other project and the yarn was discontinued. fast forward to the beginning of this summer. i decided i needed to get the sweater started back up so i picked it up in may and began again. i discovered i was missing the most important page of the pattern which contained the lace leaf pattern, so i had to contact the designer and explain that the last time i downloaded the pattern i had saved it onto my old hard drive and now i needed access to the lace leaf pattern! she is incredibly nice and sent me a new pattern out right away. crisis averted, i was back on track. after being side tracked with a few other projects, i ended up working on the lace leaf cardi again seriously in august. while spending a long weekend in roanoke va with my most knitterly (actually, she crochets like a mad woman) friend, knitting my fingers off, i ended up in the worst case scenario: i ran out of yarn. i had looked all over the house for my last ball and never found it. i kept weighing the ball of yarn and i thought it would make it. i found out during my knitterly weekend that i was terribly wrong. and yes, i repeat, it is discontinued. ravelry to the rescue, i found one person willing to sell me their last three balls in their stash. i received them this week and i am working like a mad woman to finish it before something else terrible happens. 1. i ended up cutting and throwing away some of it that got tangled and knotted beyond repair while ripping the sweater out the last time. 2. i have lost a ball of yarn in the house somewhere and i will find it as soon as i finish the sweater. 3. my gauge is very very wrong and and i measured myself incorrectly resulting in using more yarn than the pattern intended. pleeeeaaasssseeee dont let it be situation 3. i cant handle that after avoiding so many disastrous situations concerning this little brown sweater. i am almost to the waistband, so time will tell. i will keep you updated. as far as my reading goes, i have been really into poetry lately. i seem go in phases, i will devour novels for months, then move to short stories, then spend a month in poetry. i FINALLY found a copy of Mary Oliver's New and Selected Poems at our used book store, so i snatched it up. the problem is, i keep reading the same 2 poems over and over. the other collection that i am obsessing over at the moment is Adrienne Rich's the dream of a common language. when i first began this collection i was not really into it. it seemed too emotional and too angry, and i just couldnt really connect with it. but, every poem has such a different voice, and once i really started to understand her voice, i really began to become obsessed. in a big big way. also, really, i cant get the title out of my head. seriously. it is such a powerful statement in and of itself. goodness. i have about 5 books from the library sitting beside my bed, waiting on me to get started. but the truth is, i have been saving my novels and short story collections for some upcoming down time that i have planned. so there you have it. my readin and my knittin. what more could you possibly want to know???? have i told you i have a goodreads account? if you are on goodreads, i would love to see what you are reading! 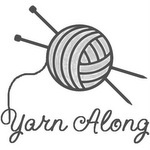 i am linking up with ginny today from small things for the yarn along. i began noticing Crosby's interest in art when he was around 13 months old. he was constantly taking my pens and trying to imitate my constant writing (i am a list maker and constant journaler- is that a word???). i went out and got him a mixed media sketch book and some decent crayons. similar to these. then when he seemed interested in a small watercolor set that he recieved from the library, i made some liquid watercolors for him to paint with. since then, our art has expanded and he has become even more interested in doing art almost everyday. Last week, i set up a small art area for him so that he can have easy access to his art supplies whenever he is interested. more on that later. being a montessori preschool teacher for several years before Crosby was born has given me so much insight into following the childs lead with art and practical life activities. today we made some more finger paint, and he was the most involved today that he has ever been in the creation process. after we were done with the stirring and measuring, i put the pan on the stove, and let him continue to mix his own concoctions of sugar, salt, and water to keep him distracted while i was stirring the paint on the hot eye. its always going to be messy. keep the attitude i have: there's no point in keeping a clean house since it will be messed up anyways. you will save yourself the energy of cleaning! see, i have helped you already. keep the steps to a minimum. try not to direct. once they are interested, try not to interfere. they become very disinterested with directions on how to do something. anything that involves pouring, scooping, stirring, is usually successful. use vibrant colors. i always use gel food coloring for crosby's art projects. i think its prettier. let them help with clean up. i put crosby in the tub with a few very small (a head cant fit in them) buckets of water. in a few of them, i made bubble water. i also gave him all of the bathtub toy scoops. he pretty much cleaned his whole body up while i was able to clean the floors and put the paint away. i checked on him every minute or so (we have a small house) but when he was done playing he was clean! and that is so much better than trying to clean him off with a rag while he arches his back and runs away! keep a sketch book. most of the time, our everyday art stays in the sketch book. it saves on wasting paper. our sketch book is currently full, so i used this big piece of white paper. i like the mixed media sketch book because it holds up to watercolor, finger paint, stickers, crayons, markers, and colored pencils. this helps me not have so many pieces of paper floating around the house and it seems really interesting to crosby to look through the book. use small amounts of ingredients. i give small portions of paints, markers, etc. it is easier to clean up spills and helps with keeping them from being overwhelmed with the project. with liquid watercolor, there is one drop of food coloring (gel) and about 2 teaspoons of water per color. when its accidentally turned over, it is soooooooo much less of a mess. when they are done, take the cue. today crosby got up and started walking around after he had been painting for a while. i took that as the cue he was done and said "time to wash" (his favorite thing! what child doesnt love messing around in the water???). once boredom sets in, don't force it, even if they have only done the activity for a minute or less. it will work out for no one. things start getting spilled, and it will be frustrating for parent and child. make it homemade. obviously, i don't make crayons or markers, but i do make the paint. i do this so that i know what is in it because crosby still thinks its important to taste everything that even closely resembles food or beverage. it doesnt concern me because i know what is in it. put water in a saucepan and add dry ingredients on top. bring all to a boil on the stove and continue stirring constantly. separate into containers and add food coloring. these will store for a week or more in the fridge. when you take it out, add a bit of hot water and stir to get it to become more runny. it gets really paste like. ohhh! also, you will have to endure some bad pictures, see above, for a bit while i figure out my manual settings on my camera. its time for me to step away from trying to edit my images and get it right the first time, i apologize ahead of time for this! so it turns out that on crosby's birthday, he pretty much felt terrible. i just wanted to celebrate it a certain way because, really, it was the beginning of the new us. the new family system. and i wanted it to be a happy and eventful day that cody and i would talk about and remember fondly. turns out, we probably will remember this birthday with great joy. obviously, the whole sick aspect was rather undesirable, but the constant napping, cuddling, and book reading on the couch was quite nice. we have eaten homemade broth and soup all week long, and it has made for an extra nice warm constant supper- as it continually cooks in the crock pot. while crosby was napping in between us on the couch on his birthday, we may or may not have eaten 2 whole boxes of valentines candy- just the two of us. i cannot say that if this was true, that i regret it. it turns out, this week has been a long week of doing just what we were doing last year this time. crosby sleeping in our arms, catching up on downton abbey on the computer (or soccer games for cody), and lots of knitting (for me at least). cody and i have spent more time on the couch this week than we have in possibly months. yes, i do believe we will have very special memories of the week of crosby's first birthday. because, just like the birth of the sweet boy, things do not always go exactly as planned. But finding great joy and solace in such simple times that are not at all what i had in my mind will most definitely be my new favorite plan. ps. i took the above picture earlier this winter. i really love it. about a month ago, cody and were out alone, enjoying some sushi that was i think made from perfection, and then some beers made from awesomeness. something about being out alone without crosby made us think of a few of our favorite memories, prechild. this visit from the past was surely because we were at a place that we most likely wouldnt bring crosby, and this place was a place where would go in the years pre marriage, and prebaby, and prehomeownership, and pre real jobs. read: during college. we remembered all of the decisions, mistakes, and awesome times. we thought about how weird it was to not know responsibility at all, and how free you are from any actual obligation, aside from the table waiting job and the classes. we laughed and thought about those times, and how fast they went by. they were like a brief flash. not one of the mistakes we thought about or the money we spent on something that we would never do now brought up any feelings of regret. because that time was then in that moment. and we lived it. and we saw it, and breathed it in completely. and then we moved on. our conversation moved on to the present, and crosby, and our funny memories we have made in the past few months. and then of course onto random topics of what we have recently heard on the radio or read on the internet. and then our conversation trailed off into future plans and goals and then the beers were done, and we went home to our warm house to be in our present. with the snuggly baby. i know that in a few short years, we will be looking back to this moment with our like minded friends, and our kids and babies will be teenagers and adults. and we will look back at these times and know that we lived them fully..... breathing in the babies, laughing at the millions of pounds of poop we cleaned off cloth diapers, and the glasses of wine or beer we would sip preciously while watching portlandia after an especially hard and exausting day of wood splitting, diaper washing, fussy teething whining, and constant, necessary and often exhausting baby wearing. "time keeps on slipping slipping slipping, into the future." daily i try to sit down and catalog at least one memory from the day. one little moment that i hope i can remember next year when i look back. i have always good intentioned with my journal- but when the choice is presented, and the contender to journaling is sleep, sleep almost always prevails. so, yes, this past weekend, in an effort to get semi organized before crosby turns one, IN TWO WEEKS, i went through a year of pictures to make a book of the past years highlights. this year, i believe i am going to do it monthly, because this book is certainly going to be at least 100 pages. does shutterfly even make a 100 page photo book? anyways, i was going through all of the 400+ pictures and never found my face without a smile. cody, crosby, and i have made some major memories this year. and some of those memories came without photo proof. which is why i keep the red daily journal. so i can jot down brief moments that i just simply CANT FORGET. because when we lay down with crosby, and he is dozing off to sleep, and his awesomely perfected sleepy playlist (patting myself on the back) is playing, i work through a series of memory exercises, in which i try to remember all of my favorite memories from the last few months. because it has almost been a year. and this time is so fleeting. it has almost been ONE YEAR people.